Hepatitis C virus causes both acute and chronic infections in individuals. Usually, the acute HCV infection is asymptotic and rarely gets transformed into a life-threatening disease. Usually, about 15-45% of people get rid of the infection and the virus within six months even without any treatment. Whereas, the rest 60-80% of the people develop chronic HCV infection. Of those people who suffer from the chronic disorder, the risk of cirrhosis development in the liver is generally between 15-30% within 20 years. Hepatitis C virus is not region specific and is found worldwide. According to a recent study conducted by the world health organization (WHO), the most affected areas were found to be Eastern Mediterranean regions with a prevalence of 2.3% and 1.5% respectively. Whereas in the other areas surveyed by WHO, the prevalence of the HCV infection varied from 0.5-1.0%. Also depending on the countries where the study is conducted, hepatitis C virus can be concentrated on a certain amount of population. As in case of the United States of America, where the HCV virus is focused on the community addicted to the use of drugs through the repeated use of the same syringes as has been found from the surveys conducted in the USA by the various health care organizations. According to sources and estimate obtained from the modeling suggest that worldwide, in the year 2015, there have been 1.75 million new HCV infections (therefore, amounting to about 23.7 new HCV infections per 100,000 people), which is a serious issue and a significant cause of concern for the doctors around the world. Hepatitis C virus infection is a worldwide phenomenon with nearly about 185 million infected individuals all around the globe. 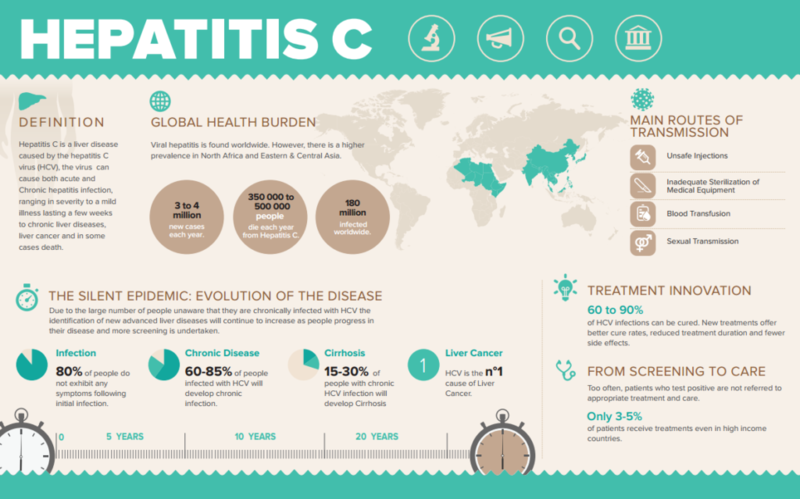 Although with modern medicines and people becoming more aware of the situation at hand, the overall number of new infections is expected to take a drop whereas the number of cases of advanced liver disease due to HCV in already affected individuals is expected to increase due to unavailability of proper healthcare services to everyone. According to a country-by-country prevalence map shown by the Centers for Disease Control and Prevention (CDC) website, most areas of Americas, Western and Central Europe, and Southeast Asia have HCV prevalence rates lower than 2.5%. The map also showed that in many Eastern European countries and areas of Central, South, and East Asia, the prevalence is approximately 3%, a value slightly higher than the usual. Among the countries topping the list with more than 3% are North America, Middle East, and South Asia. More than twenty-five to thirty percent of the people infected with a chronic HCV often suffer from cirrhosis after 20-30 years. Twenty-five percent or more of the acute cirrhotic patients have been seen to develop end-stage liver disease or hepatocellular carcinoma. However, a pre-cirrhotic infection before the onset of the Hepatitis C worsens the case. And as a result, most of the patients suffer from additional difficulties and manifestations of disease along with Hepatitis C such as diabetes mellitus, joint pain, fatigue, liver-related disorders and rarely a liver failure. These disorders increase the hospitalization for HCV patients by 15% per year and thereby increasing the number of reported diseases every year. By the report by the National Institute of Health, it has been found that chronic HCV infection causes about 2.4 million deaths every year. According to the recently unveiled report on the average annual age-adjusted mortality rate of deaths due to HCV, it increased by 0.18 deaths per 100,000 persons per year.